As the University Archivist, I frequently hear from loyal Iowa Staters from across the country who inquire about donating materials to the University Archives. Often people are trying to find an appreciative home for some Iowa State memorabilia or seeing if there is any interest in a future donation of materials. This past fall I received a call from an Iowa State alum and former ISU professor regarding a small collection of materials in his possession that he was ready to part with. Howard P. Johnson, three-time graduate of Iowa State University (we were just a College at the time he received his degrees) and former Professor and Head of ISU’s Agricultural and Biosystems Engineering Department, was contacting me regarding some World War II letters that he had. Dr. Johnson explained that he grew up on a farm near Odebolt, Iowa, and in 1943 was inducted into the military like many young men at that time. He served as a technician in the 69th Infantry Division and entered the war in Europe at the end of the Battle of the Bulge in January 1945. All during his military training and his service in Europe, young Pfc. 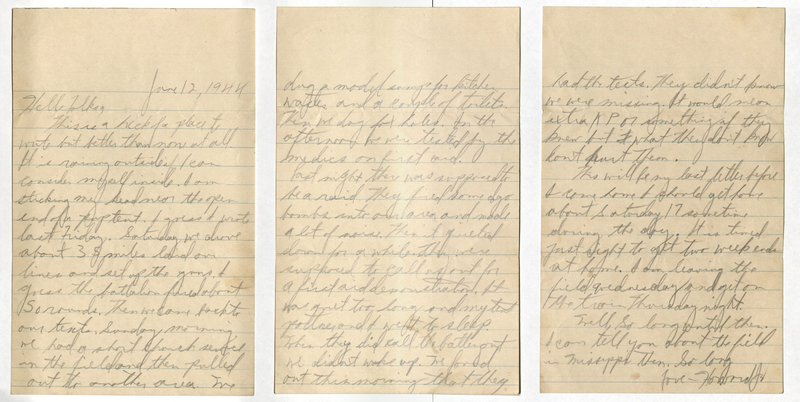 Johnson wrote to his family back home in western Iowa–often several times a week–and his family wrote back. Howard would describe his daily routine, the duties he was assigned during training, and his experiences in Europe. His parents and siblings would respond with stories of family and community events, activities on the farm, and, of course, the weather. 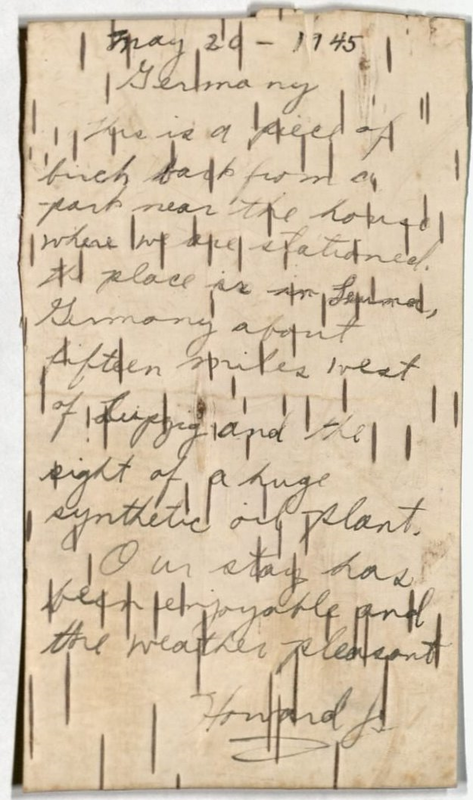 As Dr. Johnson was explaining this to me over the phone, he questioned whether anyone would be interested in this collection of letters–nearly 400 in total. Although I recognized that these letters would not hold the same meaning to others as they do to him, I assured Dr. Johnson that people will certainly be interested in reading these letters for generations to come. It is not every day that I am privileged to speak with a World War II veteran, nor is it often that such a complete collection of letters with so many connections to Iowa State and rural life in Iowa are offered to the department, so I was thrilled to accept the donation. The Johnson family letters offer an intimate snapshot of one Iowa farm family’s experience during a major turning point in American history. Similar stories played out thousands of times across the state and the country, but relatively few of those stories are so well documented. Today, as we mark the 73rd anniversary of the D-Day landings in France, it is important to reflect upon those men and women who bravely served in World War II. Some names, like Eisenhower and MacArthur, will forever be associated with winning the war for the Allies. There are many more thousands of names, names like Howard P. Johnson, whose contributions are often overlooked. At least in this case his story will be preserved in the archives. The Johnson family World War II letters are part of the Howard P. Johnson papers, RS 9/7/15, located in the Iowa State University Library Special Collections and University Archives. The department is open to researchers from 9am-5pm, Monday through Friday. Part of our mission is to preserve the history of Iowa State University and the stories of its faculty, staff, and alumni. If you have questions about whether we are the right home for your Iowa State story, give us a call, we would love to hear from you. As mentioned in Tuesday’s post, November 11th was Veterans Day, a day in which we honor all those who have served our country. 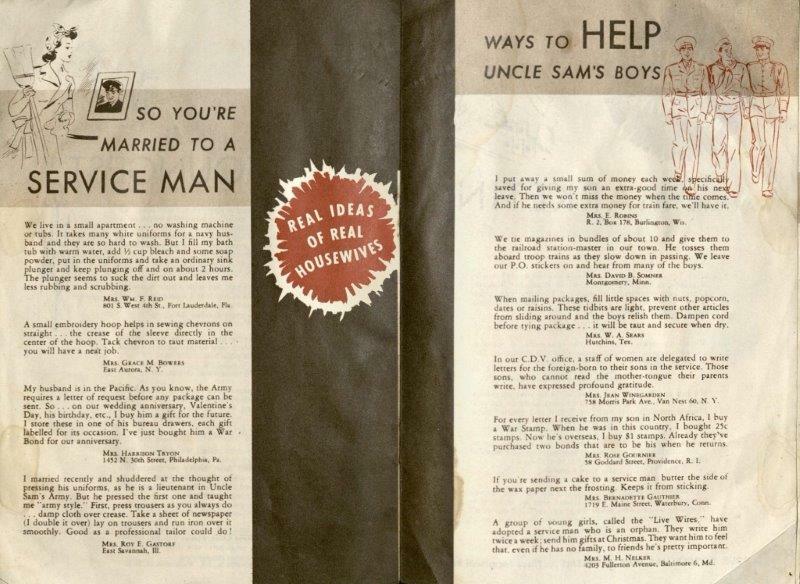 During WWI and WWII, guides and recipe books were published for the housewives left at home, which provided tips on feeding children, meal planning, home improvement and management, and practical recipes for wartime. Here at the ISU Special Collections and University Archives, we have a collection of these guides and recipe books in the Wartime Guides and Recipe Books Collection, MS 380. Preface to Best War Time Recipes by Royal Baking Powder Co., 1918 (click to enlarge). MS 380, Box 1, Folder 1. 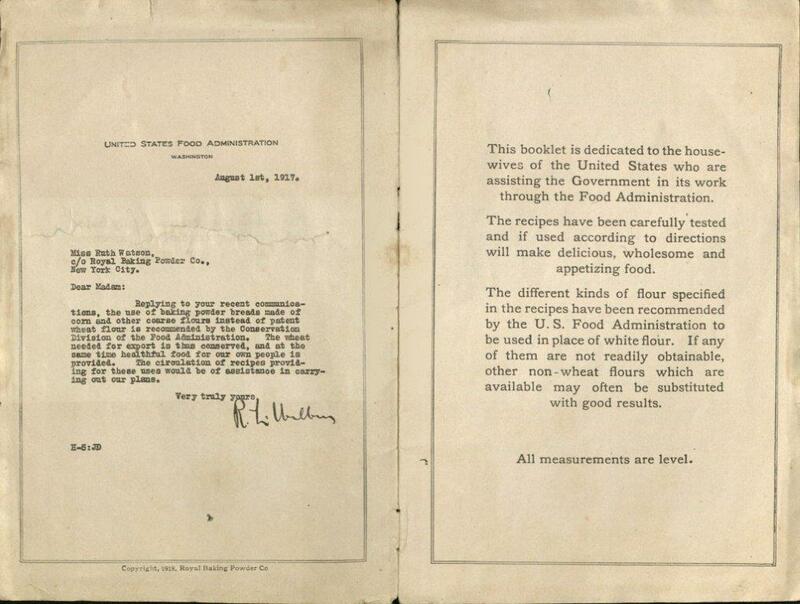 During the World Wars, food shortages were common. These would make certain foods such as butter and sugar much more expensive and impractical for heavy use in most households. These recipe books focused on maintaining a healthy diet – or at least, making delicious food – while using alternatives to scarce ingredients. A WWII-era dessert recipe booklet, undated. MS 380, Box 1, Folder 10. Boil all ingredients but the flour, raisins and soda together for 5 minutes. Cool. When cold add soda sifted in 1/2 the flour. Bake in a loaf 45 minutes, in a slow oven, or in a sheet 30 minutes. Cook corn and 2 cups of the milk in top of double boiler for 20 minutes. Add onion; continue cooking 10 minutes longer. Mash through coarse sieve if desired. Melt butter in saucepan; add flour and seasonings; blend. Add remaining 1 cup milk; cook until mixture thickens, stirring constantly. Add milk-corn mixture; return to double boiler; heat thoroughly. Garnish each serving with sprig of parsley and a sprinkle of paprika. 4 servings. A proposed weekly cleaning schedule for homemakers, 1944. MS 380, Box 1, Folder 6. Housekeeping also was (and is) a large part of being a homemaker. 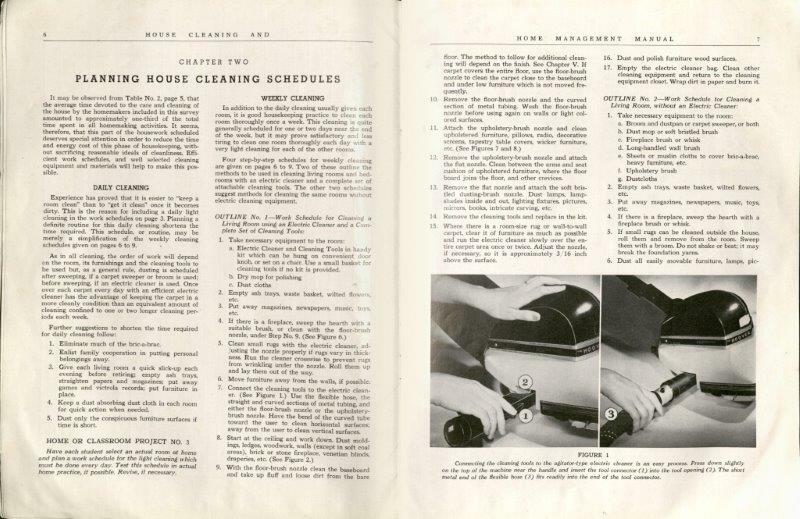 The 1944 booklet above, House Cleaning and Home Management Manual by The Hoover Company, offers many suggestions on housekeeping, including possible schedules to follow and equipment to have on hand. Without actually reading the cleaning schedule above, you can see how extensive cleaning duties could be. Examples in the booklet of things to be done daily include preparing and serving meals, washing dishes, packing lunches, planning menus, going to the market and running errands, light cleaning and dusting, caring for children and other family members, and apparently care of fires. Weekly housekeeping work includes washing, ironing, cleaning every room, washing windows, mending and sewing, special baking and cooking, and cleaning the cleaning equipment. From Real Ideas of Real Housewives on Wartime Living, undated. MS 380, Box 1, Folder 3. Of course, helping the boys from home was also a priority. The above image highlights suggestions on how to help soldiers overseas, provided by actual housewives for other housewives. Some advice includes tips on mailing packages, buying stamps, and sending cakes. This booklet also includes ways to save time around the house, keep clothes looking new, and tips on going to the market. For more WWI and WWII collections, see our manuscripts subject guides. Looking for more wartime recipes? Recipes from these eras can also be found in the Iowa Cookbook Collection, some of which can be viewed online. Thank you to all our veterans and their families who have sacrificed so much for the rest of us! In honor of Veteran’s Day, November 11, here is a picture of Navy recruits from World War II who were part of the U.S. Navy’s V-12 College Training Program at Iowa State College (ISC). Members of the U.S. Navy’s V-12 College Training Program during World War II performing a training exercise, 1945. University Photograph Collection, box 1098. The V-12 program was designed to train officer candidates for combat duty in the war. They were taught college courses and kept a military schedule. 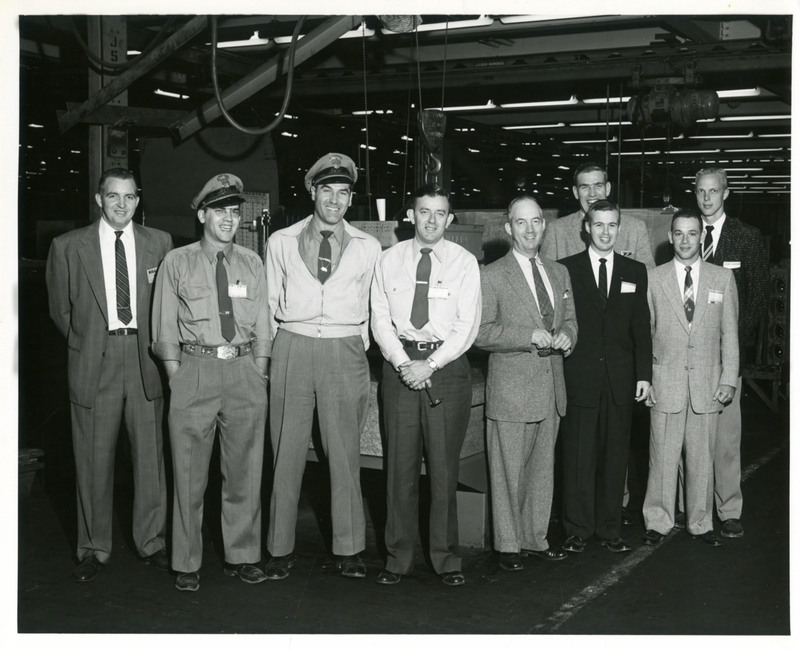 The first group of trainees, numbering 200, came to ISC in June 1942; by 1943, according to the campus yearbook the Bomb, there were 3,100 men in various Navy training programs on campus, including electrical and diesel training programs and the Bakers’ and Cooks’ School. Dorms in Hughes and Friley Halls were converted to resemble ships’ quarters. As the 1943 Bomb states, “There are no doors on the rooms, double and triple decker bunks are used and, according to navy regulation, clothing and gear are kept in ship shape and in the smallest space possible in the ship’s quarters” (149). Iowa State University continues to have a strong Navy ROTC program, as well as Army ROTC and Air Force ROTC programs. You can learn more about the history of military training at ISU in the Department of Military Science Subject Files, RS 13/16/1. Note: images and descriptions in the following may be distressing to readers. Holocaust Remembrance Day – or Yom HaShoah – was just this week (April 16th). Every year, it is commemorated on the 27th day of the month of Nisan in the Jewish calendar, which correlates to sometime in April or May in the Gregorian calendar, depending on the year. Another remembrance day, International Holocaust Remembrance Day, is held on January 27th and commemorates the anniversary of the liberation of Auschwitz-Birkenau. Yom HaShoah is largely observed in Israel and in Jewish communities throughout the world and marks the anniversary of the Warsaw Ghetto Uprising. Considering the tragedy that was the Holocaust and the lessons that were learned from it, more than one recognized day of observance seems justified. It might be a surprise to learn that we in the Special Collections Department at ISU have materials related to the Holocaust. Admittedly, there’s not much, but what we do have is certainly interesting. Today, the United States observes Veterans Day, which commemorates veterans of all wars. If you’re familiar with Iowa State University, you probably know Henry Montgomery Black – even if you don’t think you do. Professor Black, a World War II veteran and the head of the Mechanical Engineering department from 1946 until 1972, is the namesake of the Black Engineering Building. Special Collections hosts the Black Family papers, and we have recently processed Henry Black’s professional papers from his tenure at ISU. As is to be expected, the Henry Montgomery Black Papers provide insight into the field of mechanical and professional engineering, particularly at Iowa State University, his alma mater (1929) and employer. Dr. Black was very interested in the direction of engineering education; this interest led him to roles in a number of engineering organizations, including the American Society of Mechanical Engineering (ASME), the Engineers’ Council for Professional Development, and the National Council of Examiners for Engineering and Surveying. Since many, if not all, of his students aimed to become licensed professional engineers, Black kept a hand in professional engineering standards and examinations, serving in a leadership position on the Iowa State Board of Engineering Examiners for several years. The collection reflects all of these associations and his contributions to them. Henry Black was a man of many interests, and his papers sketch a more nuanced picture of his contributions outside of engineering leadership. As an example, for nearly 20 years Black worked on the annual ASME design problem contest, a challenge aimed at inspiring creativity from engineering students that is still in existence today. He was interested in practical applications of engineering, not just its study, and the contest was a way to help students apply their knowledge. The papers show that the professors who wrote the test questions were challenged to develop difficult problems for students to solve! He was also an amateur historian who collected historical information for the institutions to which he claimed allegiance. His papers contain notes on the history of mechanical engineering at ISU, which he used as department head and professor; the history of mechanical engineering in the United States, which was relevant as a member of ASME’s Centennial Committee and its the History Subcommittee; and the Army Reserve’s history at ISU, which was important to him as an alumnus and a World War II veteran. Black’s military career is represented in his professional papers as well. A famous saying goes, “once a Marine, always a Marine,” and the sentiment applies to Black’s Army service as well. His Army career started in 1929, when he joined the Reserves upon graduation from Iowa State. This led to his role as chief engineer of the Army’s landing at Utah Beach during the Allied invasion of Normandy on June 6, 1944. 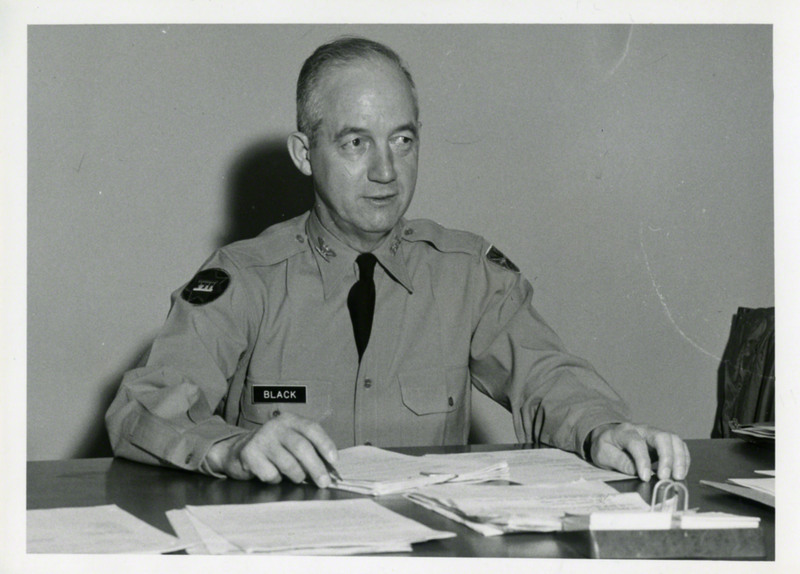 Black resumed his reservist status when he returned to Iowa State and did not retire until 1960. Over those nearly 15 years, as the commander of a U.S. Army Corps of Engineers group, he attended and led training for other soldier-engineers. These case studies and problems appear in his Iowa State files, indicating that perhaps the Army Corps of Engineers were not the only one to benefit from Black’s time in its employ. Black’s contributions extend to the community of Ames as well. He was active in the Tall Corn Area Council of the Boy Scouts of America, using his engineering insight to help maintain various Boy Scout camps in Iowa. As evidenced by a scrapbook and newsletters in his papers, Black served year-long presidencies of the Ames Chamber of Commerce and the Ames Rotary Club and was a long-time member of both organizations. Curious about the history of these business and community service organizations in Ames? The Henry Black Papers can satisfy that craving. For more information about the Henry Montgomery Black Papers (RS 11/10/19) or our other faculty and alumni collections, please visit us online or on the fourth floor of Parks Library in the Special Collections department, open M-F, 10 am to 4pm. A copy of the paper’s finding aid, listing all the materials and providing more background on the collection, is also available online here.